Have you ever tried Spanish patatas bravas? They’re delicious fried potatoes with tomato sauce. 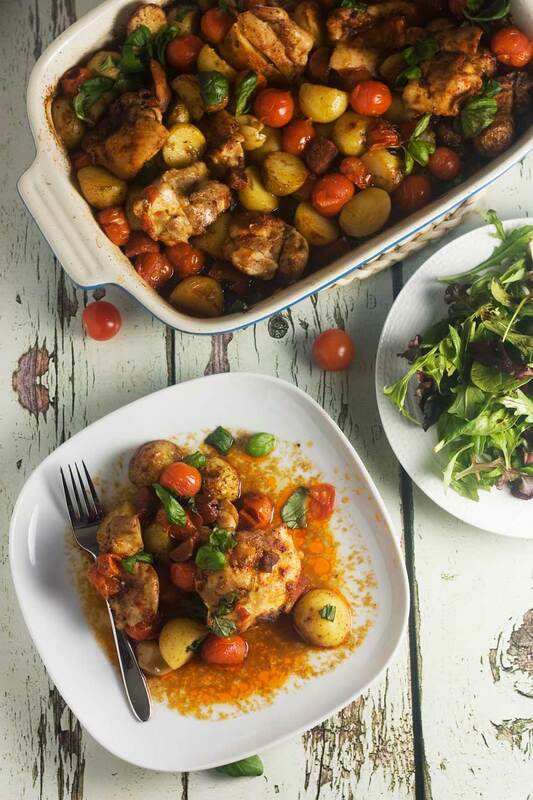 Now imagine how tasty they are baked with chicken and chorizo … all in an easy one-dish tray bake! One of the reasons (well, OK then, the main reason …) I chose my university course was because I got to spend a term in southern Spain. I was even more sure of my choice though when that time in Spain arrived and I got to sample some ah-mazing (and totally free!) tapas in the local bars. In one bar at the end of my street, you were actually able to order your free tapas with your drink from tens of options on the menu – as in, order exactly which one you wanted. Where else in the world would a bar owner offer so many top quality little morsels with their drinks … and all for nothing? OK, you buy the drink, but still … I love southern Spain!! Anyway, one of these free tapas that I remember licking my lips over the most was ‘patatas bravas’ – a simple dish of fried potatoes with a tomato sauce. There are many different versions of this in different areas of Spain. In Valencia, for example, the sauce can have paprika, chili and vinegar in it. You are going to love this tray bake. Mr. Scrummy and I have been ‘testing’ it out in various forms for months now, so I know it’s delicious. We always add plenty of cherry tomatoes so that you get loads of juice but this was the first time we’d added the potatoes. I made sure I gave the potatoes and chicken a head start in the oven, too, before adding the juicy tomatoes. This way, some of the potatoes end up quite well done and even a bit crispy in parts … just like real patatas bravas. This is a very no-fuss, one-pot meal – my favourite – and is ready within about an hour. Just peel and chop, stuff into the dish and bake! Then serve either by itself or with a nice fresh green salad and a bit of bread to mop up the juices. Honestly, those juices are truly delicious. All tomato-y and sweet and paprika-y and with a slight tang from the balsamic. Mmmm! Oh, and most of the credit for this beautiful dish should go to Mr. Scrummy as he’s been making something similar for aaages. Thank you very much, Mr. Scrummy! 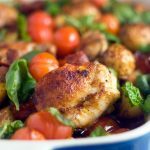 Chicken thighs, spicy chorizo, mini potatoes and lots of garlic ... all sprinkled liberally with smoky paprika and baked in just one pot. This is like a Spanish 'patatas bravas' but with lots more 'oomph'! Such a deliciously juicy and easy mid-week meal! Preheat the oven to 180C/355F. Put the baby potatoes in a large baking dish or roasting tray along with the garlic. Rub the paprika all over the chicken, then tuck it in between the potatoes and garlic in the dish/tray. Drizzle everything with olive oil (probably about 2 tablespoons) and jiggle around a little. Finally, sprinkle the cayenne pepper over the chicken (if using) and grind a generous amount of salt/pepper over the whole dish. Bake for about 30 minutes, then remove from the oven, jiggle the potatoes around a bit and add the chorizo to the dish (poke it down well so that it doesn’t dry out). Then add the tomatoes. Return the dish/tray to the oven for another 30 minutes. 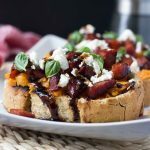 Remove from the oven and drizzle over the balsamic vinegar. Scatter over the basil and serve. Lovely served with a fresh green salad and some fresh crusty bread. Don't forget to squeeze all the lovely sweet, roasted garlic cloves out of their skins when you're eating .... yum! Now this is my kind of meal! I seriously love every flavor!! Thanks, Marissa. Me too … I’d be happy with these flavours every day! I seriously adore Spanish food- this looks absolutely perfect in every way! Jealous of your Spanish college food adventures! Thanks, Chrissy! I must say those were some of the best months of my life. What an opportunity! A tray bake is where it is ALL at. Free tapas? That is awesome! Though I still like this better – all those extra ingredients take this to the next level. It sounds like a flavor party! The free tapas are pretty unbelievable, hey? At least we can recreate those yummy flavours at home,though! Spanish food is one of my favorites – such wonderful flavors! I love lots of garlic and the cayenne for some extra heat. Great dish, Helen! Thanks, Kathleen! I know this uses some classic flavours but hey, you can’t really argue with classic! Now this is a dish that makes you dive and go back for seconds. What a hearty delicious recipe. I need to try this soon. Glad you like it, Janette. I love these kinds of simple one-pot meals! I love LOVE LOVE patatas bravas!!! I have to make some actually for a party this weekend!!! Thank you for reminding me of their excellence!!! This looks super yum too! And I am particularly jealous that you got to go to Spain and nosh on free tapas! I hope your party and your patatas bravas went well! I love no-fuss, one-pot meals and this looks and sounds delightful! Thanks so much for the nice compliment, Dannii! This is my kind of recipe. I love the flavors and the ease of making it. Thank you, Kathy. That’s why I like it, too! Oooh, well Spain must hold some wonderful memories for you then! I feel very flattered that you like this enough to make it, Allie … thank you! It’s like you made this just for me. A the flavours I love. One tray. I love love LOVE this!! Pinning wildly!! I really need to figure out a way to share this with my readers. This is totally the kind of food they love! Thanks so much for pinning, and go ahead and make this for your readers too if you like … I would take that as a huge compliment! such a delicious dinner. a great dish for the whole family! Hello, Kelsey … and thank you so much! This is indeed a great family dinner! This bake sounds amazing, Helen! I love the combination of chicken and chorizo. A definite hearty and delicious meal, especially with those fresh veggies. Sounds so delish! Thank you so much, Gayle! So happy you like it! 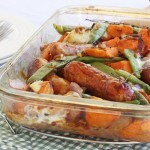 This is such a beautiful dish Helen, love chicken and sausage together. Thanks so much, Cheri! The chicken and chorizo are good, aren’t they? Very moreish!! Well thank Mr. Scrummy for this delicious dish. I can’t pronounce the name of it, but that doesn’t have to stop me from devouring it. 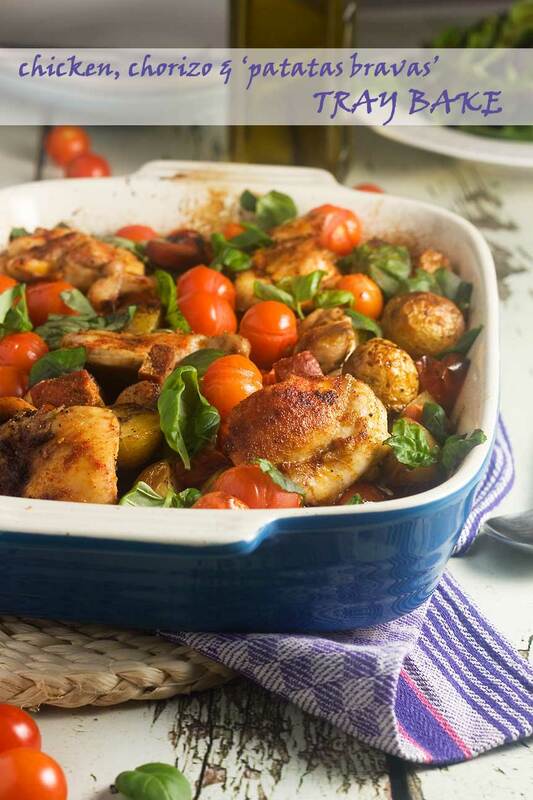 I love the cherry tomatoes in there and can totally see why the potatoes were added. This just screams yum from start to finish. And it uses thighs, my mom is always on me to use thighs because they are juicier and more tender says she! This is how food is meant to be eaten! Simple, delicious ingredients hardly altered at all. I love your story of Spain, I wish I had been there myself. Especially to the place with all the free food… with the purchase of a drink, of course. What an amazing experience! I can’t wait to try this recipe, Helen, it’s a keeper! Thanks so much, Megggan … this is certainly a keeper in our house. We have it all the time! I really hope you get to visit Spain some time and taste those wonderful tapas for yourself. In the meantime, though, you can have a go at this dish! Well done Mr Scrummy for the inspiration! I love patatas bravas and adding chicken and chorizo is nothing short of brilliant 😀 I can really imagine those flavours going well together! Thanks so much for the kind words, Lorraine .. I will pass them on to Mr. Scrummy and I’m sure he will feel very honoured! Tes patatas bravas ont l’air vraiment des tapas espagnoles !! Tu avait étudie à Granada, n’est pas? Dans cette ville les tapas sont formidables et comment tu bien dit, gratuits!! Las patatas bravas sont une des mes tapas favorites, très simple et tellement bonnes ! Thank you so much, Sarah … definitely hello weeknight dinner! Yum! I love a simple tray-baked dinner. Love hearing the inspiration for this dish – wish we had free tapas with drinks here! Ooh, sorry about making you lust after a trip to Spain, Ashley! At least you can make this easily at home, though! 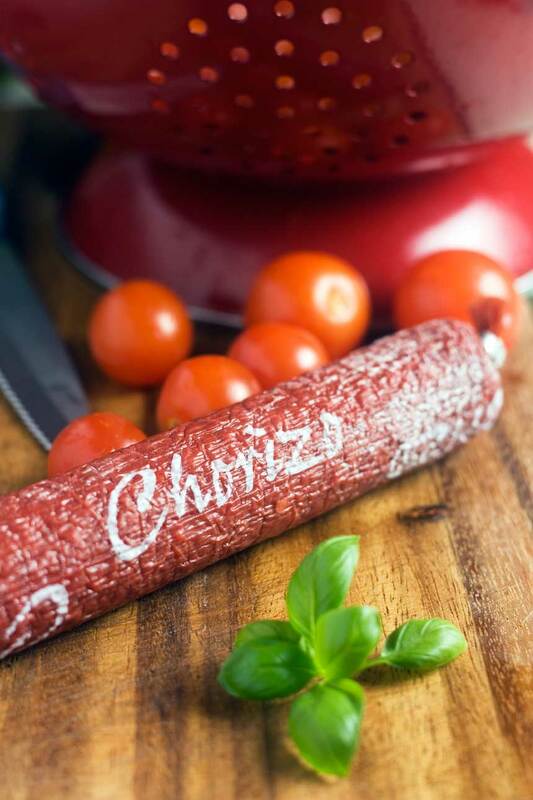 I love your chorizo photo, Helen! Sometimes I’m so jealous of you living overseas and all the delicious food you get to eat on every corner!! We just have hamburger shops all over, haha! I do get to eat some good Mexican food where I live though! I love all the flavors you have baked in here! Hi, Marcie! I really hope you get a chance to go to Spain some day. Some of the tapas there really are fabulous. P.S. My fave part is the chorizo, too! It adds so much flavour. Great recipe! Thanks for posting on Yum Goggle and we hope you will continue to submit! Now following on all our social media outlets and shared on all our outlets! What a genius idea to make a patatas braves traybake! Yum! 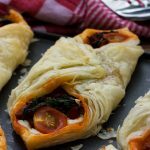 Have you tried making this with smoked paprika? I’m obsessed with smoked paprika, and I think it would work really well in this dish! Thanks for the great idea to use smoked paprika. I think it would work perfectly too – I’ll try it next time!